Architecture marketing is what an architect must think about for building a prosperous business. Nowadays business success fully depends on a digital presence. But it becomes harder to reach out to consumers due to the information noise. Nevertheless, there are a lot of architecture marketing strategies that can help to reach out to new clients. How can an architecture firm owner differentiate his business from competitors? Should an architect focus on expanding a portfolio by services of Architectural Rendering company? We have put together this list of 6 effective strategies that can be useful for architecture business. Building an exceptional brand is important to distinguish a firm from the crowd. Architectural firm branding must identity unique features for the business to focus upon. Сonsider goals and technology, what is special about them? If all the firms in industry provide the same services without any significant difference, a lower price can give an advantage. Stand out from the crowd. For all the architectural marketing ideas focus on brand uniqueness. Brevity is the soul of wit. As brief messages are processed better, architecture firm owner must be laconic to break through the noise. Therefore, use short informative sentences and get to the point. In such case, architecture advertising messages will be easy to read and attractive for the audience. So it is worth adopting this rule in digital architecture marketing strategy. People think not by words, but by images. That is why advertising message should appeal to their emotions through associations. For that reason, try to involve not only logic, but also kinesthetic, audio and visual images. Professional 3D rendering services can help to make proper associations. To get to know the public, learn more about various marketing architectural services. For example, social media marketing plays a significant role in how customers and businesses interact. No other channel enable a dialogue between clients. Being successful means to understand the needs and expectations of a customer. While creating a website, take into account the option of feedback, due to which visitors can easily get in contact with you. Also, be sure to reply to every message and comment respectfully. This architecture marketing strategy means always being where the customers are and use different channels for communication with audience. Share interesting content on Facebook, Linkedin and on the website, then consumer loyalty can significantly increase. Also you can reach out to clients with the help of email marketing. For example, create an email newsletter to answer the questions and help potential clients to solve their problems. But the most important thing in multichannel approach is to repeat a message by means of every platform. As people can ignore most advertising messages, repeating through various channels is effective way to break through the information noise. It can help to gain more attention for business and the chances of being heard are enhanced. 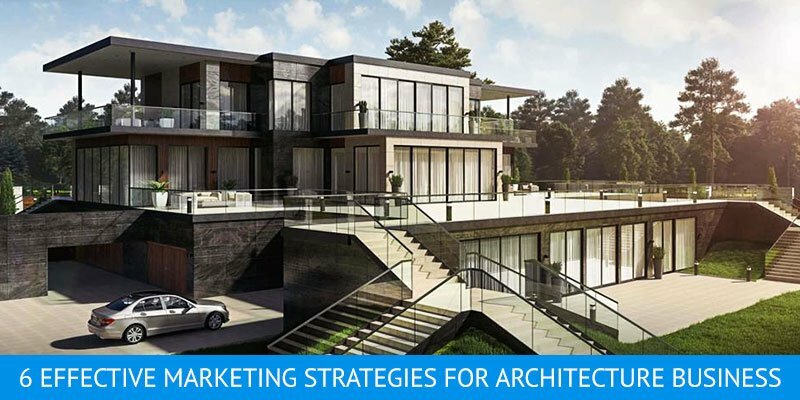 Summing up, we have made a review of 6 most popular architectural marketing strategies that can help business to prosper. These tips will enable you to stay in touch with existing clients and find new ones online. Use digital technology and 3D rendering services to feel a benefit. hi! good morning, i really love your materials! Thanks for providing data that specifically deals with architecture marketing strategies and help me to add better fortune to my business in quick and effective manner. Your blog post is amazing!